My immediate response was no, but then I thought about it for all of two hours and decided, sure, why not. I need a project to get me back into serious writing after the break I’d had. So I signed up and then the question became, what am I going to write? I have a novel series that I consider to be my primary project, but I’d already decided not to write any new material until I had worked on what I already had a bit more. I considered using the story I had already started planning for NaNoWriMo in November, but I had a fairly solid plan for that, and I still had a lot of outlining I wanted to do before I started writing. So, that left me with the option of attempting the challenge with a brand new, fresh idea. A genius plan this was not. While I know I can do it, I learned that I cannot make myself do it. I have written 50k and more in a month without an outline before, but it was a project I felt inspired by. 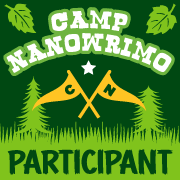 The idea I chose to use for Camp NaNo was barely more than a feeling that the characters and world I had used for a short story had more to give. I eventually struggled through 30k. Can you schedule creativity? It’s a question a lot of authors will likely come across sooner or later. It may be trying to make time in a busy life by allocating that hour before dinner as writing time, or trying to bash out a short story for that submission deadline next week. If you’re lucky it may even be when your publishing contact comes through with a deadline at the top. So far I have been lucky enough to be able to run with my creative whims, but I do not want to be a slave to them. Is it just a matter of disciplining one’s self, or does the quality of what you produce suffer when you can’t write how and when you want? I have found I often feel less satisfied with the work I plan than the work that flows out on its own, but perhaps that is just my own view of it. For NaNoWriMo in November, I will be working on a planned, outlined idea and I am setting myself the challenge of completing the re-writes and edits within the following four months. I hope that by the end of it I will better understand myself and whether I can successfully schedule my creativity. Tell me about your experiences with writing to deadlines and with letting your creativity flow unstructured. Can creativity be scheduled? What techniques have you employed to help you structure and schedule your writing? I find my writing is so much better when it is unplanned. However, having a deadline pushes me on to find more of those ‘moments’. When I sit and feel like writing is a chore, but I must get this finished, it is absolutely dreadful. Good luck with finding your own path. I very rarely use an outline, and when I do, it’s nothing more then notes in point form. Does this get me into trouble? Yes, many times I have written my characters into bad situations that have forced me to backtrack to a previous fork in the road, sometimes this is better but not always. I’ve done NaNo with scheduled write times, and hated half of that story, and I’ve done it by writing whenever I was inspired – good story but lots of sleepless nights. Last year, I wrote in little 20min. spots all day long and it is the best written rough draft I’ve ever done. I found it kept the story in my head all day long and when a certain scene worked itself out I could sit and write it in that moment. I often ‘daydream’ my scenes but sometimes don’t get the chance to write them out afterwards and by the time I do get the time, I can’t remember that great scene that I had. That is very frustrating to me and one reason why I like to keep my computer on all day and visit it various times. Great post, all this talk of writing and I’m starting to get ideas for Nano! I never decide what I’ll write until the last minute! Its tricky, whilst you can’t essentially plan creativity, if you have the background idea and a basic strategy on how to tackle it, writing it can be planned. It’s finding that idea for inspiration thats the key, if you only have a slight idea, you’ll find 9 times out of ten that it falls a little flat after a bit as you haven’t quite grasped the characters and you’ll inevitably find yourself writing into a wall. Currently I’m mid plan for a series of children’s picture books featuring an animal knight. Now I know what he is and some basic idea’s but I haven’t rounded him/her out enough for them to step out of shadow with any real clarity. When I have that down, I think I’ll be able to do it. Until then, its just a concept with no real direction. You raise some interesting quetions in this post. I wrote my first novel without an outline and it worked out for me. Since then, though, I use outlines that are quite broad, with only the major plot lines mapped out and the characters very clearly developed before I write. Shorter pieces, like blog posts, I generally have a plan for, and I find I can write those, more ‘on-demand’ than a more difficult, or longer, piece of fiction. Good post Chrissey! And good references to Nano which definitely make you work hard on your creativity. As smoothly as it flows, its still hard to force it out when there are deadlines. But, I guess that’s something we have to get used to as authors if we want to meet deadlines with our future editors and publishers. I love winging it, and outlining stifles my creativity and yet I’m forcing myself to do it. As painful as it is, I’m hoping it takes me in the right direction to help my manuscript flow from start to finish.